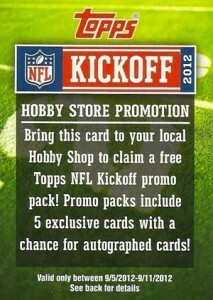 The 2012 Topps NFL Kickoff is a promotional set of 50 cards. Designed to be given out at participating hobby shops, collectors would get a pack of five exclusive cards for bringing in a redemption card found in random packs of 2012 Topps Football. The promotion's window is short, running September 5 to 11. 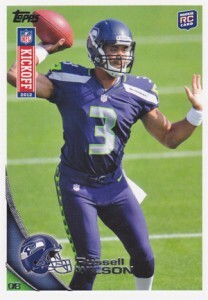 The 2012 Topps NFL Kickoff checklist has 50 cards including a lot of the year's top rookies like Andrew Luck, Robert Griffin III and Russell Wilson. Veterans include Cam Newton and Tony Romo. The set also has such Hall of Famers as John Elway, Jim Brown and Emmitt Smith. Random packs also have numbered autographs. These autographs are parallels of the base set. Each is serial numbered, but to varying amounts. 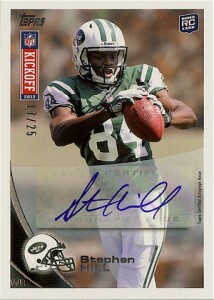 Below are the checklists for both the 2012 Topps NFL Kickoff set and the autographs, both of which were provided by Topps. We're adding autograph print runs as they surface. All autographs are serial numbered. We will add these print runs as they surface. If you know one that's missing, please feel free to leave a comment below or send us an email. Hi there…the Alshon Jeffery auto is #’ed /25…pulled one yesterday. Ray (ID 59232) � Thanks and congrats! Tony Romo is #’ed /10. Hunter (ID 61796) � Thanks!